This vacation rental condo in the Northern part of Kihei is centrally located. Within walking distance, you have the world’s best beaches at your fingertips. Literally walk across the lawn to get to The Pacific Whale Foundation viewing outpost; perfect for whale watching during the winter season. You have Kalepolepo Beach within minutes, as well as Waipuilani Park, perfect for an early morning jog or sunset stroll. You can also walk to Azeka Shopping Center, which is home to delicious restaurants, a supermarket, gas station, CVS, bank and even a gym. From the resort rental property, you have easy access to the highway to go further South or head North towards town, upcountry, or Lahaina. 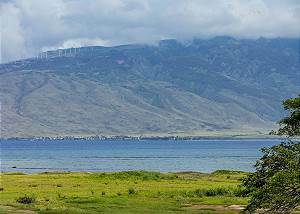 A few minutes North of your vacation rental, you have the Kealia Pond National Wildlife Refuge. Here you can explore the wetlands and native bird species, tan on the beach or take a stroll on the 2,200 foot long boardwalk. Take a leisurely drive down the road to reach world renowned Wailea, where you can shop, eat and golf to your heart’s content. Head to the Shops at Wailea to browse art galleries, buy gifts and eat ono (delicious) food. The Shops at Wailea often feature special hula and ukulele performances so keep an eye out! Nearby you also have the Wailea Blue Golf Course, Emerald Golf Course, and the Maui Nui Golf Club. This North Kihei oceanfront building comes with everything you need to feel right at home. It is one of very few apartments in the area that has a new central air conditioning system. This means no noisy window units! You can go outside and soak in the warm Kihei sun, then retreat to the cool, crisp air in your condo. The condo facilities are perfect for staying active and having fun on your vacation. The building comes with a volleyball court, putting green, shuffleboard, pool, sauna, hot tub, and gas grills all on-site. You can easily play some volleyball, cool down in the pool, barbeque and then enjoy the hot tub. For tennis fans, a public court at Luana Kai is only a short five-minute walk away. Whether you are a family, couple or looking for your own personal retreat, our North Kihei vacation condo is perfect for you. This charming town offers incredible relaxation in tropical paradise with access to world-class facilities and entertainment. Contact us now and book Kauhale Makai today for your best vacation ever!